Stick Dog and his friends are so hot, and desperately want some fresh water. They go in search of some, and count on Poo Poo's sense of smell to help them find it. They come across children playing in a lawn sprinkler, and have a humorous tussle with it. What really intrigues them, however, are the sweet, sticky puddles that they find on the pavement after a music playing truck visits a neighborhood and people get things from a man in the truck. Since dogs can read (I knew this! ), the dogs know that this is ice cream, and they decide it will make them cool and give them refreshment. They stalk the truck and plan a very brilliant heist. 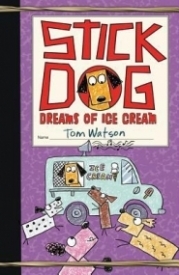 Other titles include Stick Dog, Stick Dog Wants a Hot Dog, and Stick Dog Chases a Pizza. I am hoping that the final book in the series will involve the dogs going for Chinese food and being adopted by loving families! The books in this series are becoming increasingly clever. While the dogs have had strategy in the past, this really goes above and beyond. They do, of course, get momentarily distracted by squirrels, but who doesn't? The illustrations, while primitive, are very charming. I can see these being easily copied by elementary school students, who could do their own versions of Stick Dog, encouraging creativity. This series would be my number one pick to take on a long car ride if I had a children between the ages of 4 and 18. Unlike Wimpy Kid books, which are full of middle school themes, these appeal to the younger readers while still being amusing enough for parents, with some jokes that first graders wouldn't get. Since it's not essential to read the books in order, these could be passed around so that everyone could read them, or they could be read aloud, as long as the person in the passenger seat doesn't get car sick!